Two new titles in the Kew Gardener’s Companion Guides are set to publish this month (March 2019) adding to the already popular series of beautifully illustrated, giftable but practical gardening companions. All books in the series are written and endorsed by world experts from The Royal Botanic Gardens, Kew and combine exquisite botanical illustrations from the Kew archives with practical indoor projects. ‘Growing Herbs‘ by Holly Farrell, will find favour with anyone who wants to discover the benefits of growing herbs, their flavours and scents. Growing the source of these intense flowers can now be a reality for gardeners and food enthusiasts with any size of garden, from an acre to a window box. Culinary herbs can be used as seeds, flowers or leaves, cooked and eaten themselves or used to infuse a dish or a drink. They are now being used in artisan gin, ice cubes and cocktail syrups, and often the only way to capture that elusive flavour is to have some home-grown, freshly harvested herbs on your doorstep. 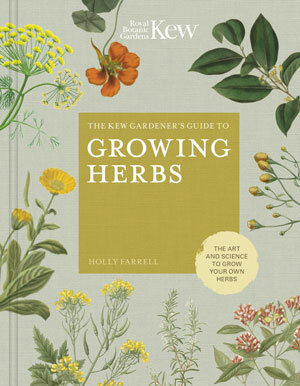 Holly’s book has comprehensive information on how to plant, propagate, harvest and use herbs. She identifies 75 of the most exciting herbs and includes projects for each section including creating a vertical herb garden, using herbs as cut flowers and harvesting seed and fennel pollen. There is much to discover in this neatly compact book and each herb has its own page with advice on how to use, grow and harvest. Try Lemon Balm tea for a pick-me-up to low spirits; chewing some parsley after a meal to ease digestion or use Carolina allspice as an alternative to any dish that would otherwise include cinnamon. There is a section on naming herbs, troubleshooting and what to do when and the book is fully illustrated. Published in hardback ‘Growing Herbs‘ is priced at £12.99 and published by White Lion Publishers in collaboration with The Royal Botanic Gardens, Kew. ‘Growing House Plants‘ by Kay Maguire, looks at the art and science of growing your own house plants. I have often heard the expression: “I can’t grow houseplants, I kill them” and if this is you, or you simply want to expand on your knowledge of growing house plants more successfully, this is the book for you. The book is easy to follow and has a wealth of information and ideas. There is plenty to motivate even the most reluctant indoor gardener to have a go and discover just how enjoyable and easy it is to grow plants indoors. Houseplants can bring much pleasure and brighten up the home and in the book Kay discovers over 70 life-changing plants from Jasmine, Swiss cheese plants and Geranium to Button fern and Cape primrose. There is a comprehensive introduction covering topics such as value of house plants, what is best to grow and where, propagation, compost and display and materials. Each plant page contains information on where to grow, how to grow and growing tips as well as suggestions for other notable cultivars. The projects in the book are also easy and simple to achieve such as the Shallow bowl of succulents, ideal for growing in an attractive planter in the heat of a sunny windowsill. Kat is author of the award-winning RHS How to Grow Your Own Crops in Pots and is a regular contributor to many gardening magazines. She was Horticultural editor of BBC Gardeners’ World for six years. ‘Growing House Plants’ by Kay Maguire is in hardback at £12.99 and is published by White Lion Publishing, as part of the Kew Gardener’s Companion Guides. Published March 2019.